Yes, it's perfectly safe – and socially acceptable – to cook fish from a frozen state. 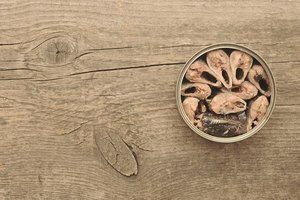 The only significant differences between preparing frozen salmon and fresh or thawed salmon is that you need to partially defrost it before you can season it, and cooking time is about 50 percent longer when the fish is frozen. Since unfrozen salmon fillets typically cook in about 10 to 20 minutes, this isn't too big of a deal. Some cooking methods are better suited to frozen salmon fillets than others, though. Stay away from the frying pan, for example, or you're in for a lot of splattering oil and unevenly cooked fish that's overdone on the outside before it's cooked through in the middle. But with a few viable options, you can easily and successfully bake frozen salmon, grill it or poach it. Preheat the oven to 425 degrees Fahrenheit or the grill to medium-high. 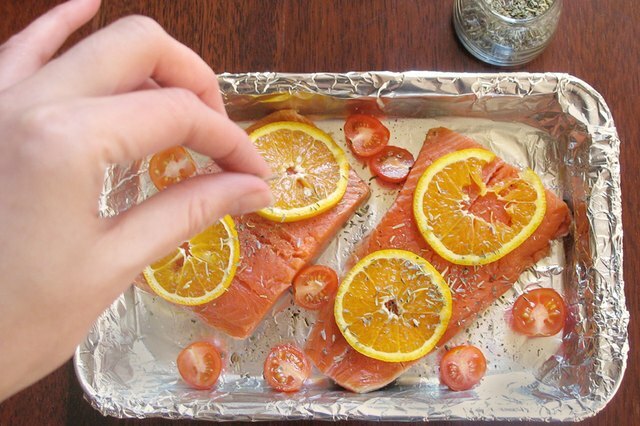 Wrap the frozen salmon loosely, but completely, in aluminum foil and place it on the grill or on a baking sheet. Put the salmon into the oven with the skin side down for five minutes. You're steaming the fillets first to thaw them in a way that helps prevent them from drying out too much. Then, unwrap the salmon and discard the foil. Brush the fillets with cooking oil or melted butter, then season to taste with salt, pepper and any herbs, spices or aromatics you want to use. Dill, lemon zest and minced garlic is a nice combination for baked or grilled salmon. Return the unwrapped fillets to the grill or oven and cook them until they reach an internal temperature of 145 F at the center, as read with a meat thermometer. The flesh should be opaque and flake easily when pressed with a fork. 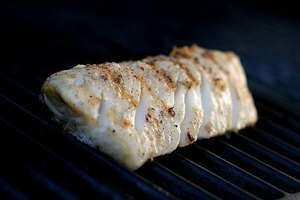 Cooking time varies by oven or grill, thickness of the fillets and other factors, but it should take about 15 more minutes. Select a deep pan that's large enough to fit the frozen fillets in a single layer with a little space between them. Combine equal parts water and dry white wine. Fill the pan to more than cover the fillets, typically about 2 to 3 inches. Add 1 tablespoon of vinegar per quart of liquid, salt and pepper to taste, and any herbs, spices and aromatics you want. Chopped carrots, onion and celery, along with minced garlic and dried thyme, is a tasty way to go. Bring the liquid to a boil over high heat, then turn it down to medium-low and simmer for 10 minutes with the pan partially covered. Add the frozen salmon, partially cover the pan and return the liquid to a simmer. Simmer for approximately eight to 10 minutes, then remove the pan from the heat and let the salmon sit in the liquid for about another two to three minutes. Use a meat thermometer to confirm that it has reached 145 F at center. Serve hot or chilled. Put the salmon in the refrigerator for about 24 hours. Never thaw seafood, poultry or meat at room temperature. 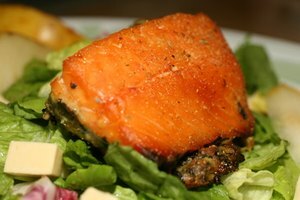 Cook salmon thawed in the fridge within two days; it's safe to refreeze it with or without cooking it first. Immerse the salmon fully in cold water in an airtight package. This takes about 30 minutes to two hours. Change out the water for new cold water every half hour. Salmon thawed by submersion must be cooked promptly and should only be refrozen after cooking. Use the defrost setting on your microwave to thaw salmon in minutes. It will start to cook, though, so you have to finish cooking it immediately, and some of the fillet will probably end up overcooked using this method. Only refreeze the salmon if you cook it first.